A Diamond Select Release! 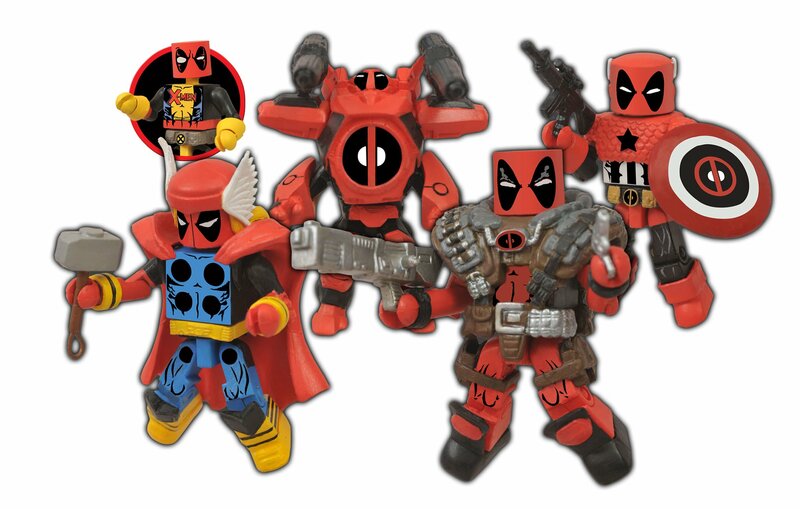 Deadpool wants his own Marvel Minimates four-packall to himself, and he's just crazy enough to pull it off! This set includesthe Merc with a Mouth as Thor-Pool, Cable-Pool, Captain Ameri-Pool and IronDeadpool (with an X-Men-outfit Deadpool underneath the armor), plus enoughswords and guns to bring down an entire AIM installation! He's a one-manAvengers team! Each Minimate measures 2 inches tall with 16 points ofarticulation. Packaged in a four-color window box. Designed by Art Asylum! From the Manufacturer A Diamond Select Release! Deadpool wants his own Marvel Minimates four-packall to himself and he's just crazy enough to pull it off! This set includesthe Merc with a Mouth as Thor-Pool, Cable-Pool, Captain Ameri-Pool and IronDeadpool (with an X-Men-outfit Deadpool underneath the armor), plus enoughswords and guns to bring down an entire AIM installation! He's a one-manAvengers team! Each Minimate measures 2 Inch tall with 16 points ofarticulation. Packaged in a four-color window box. Designed by Art Asylum!